For the past 2 years, I’ve had to modify my diet. I’m almost 51 and it’s harder to keep weight at bay… so I’ve cut out gluten, sugar and most dairy… and eat Low fat now. I think I’ve finally weaned myself off sugar because my sweet tooth seems less demanding! I never thought I would see that day coming! I love how the grocery stores today are helping with the prep work! Already cut up veggies makes this a super simple supper! 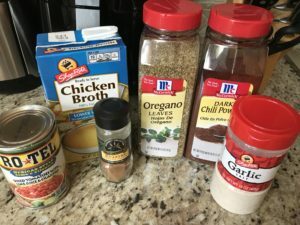 Just throw all of these ingredients into a skillet with a little broth, add lid to “steam” and then add some low sugar full of flavor Fra Diavlo sauce and some crushed red pepper and you have yourself a meal! I’m a huge fan of spices to really kick up simple dishes a notch! Add some protein… some sautéed shrimp, chicken or chicken meatballs 🙂 and you have a super healthy meal in less than 20 minutes! So next time you’re at the store, avoid the pre-packaged foods with lots of preservatives…. go with fresh ingredients…. cut up if necessary to save time and you’ll be on your way to healthy in no time! What are your go-to healthy meals? I’d love to hear! Cooking skinny so you can get in that bathing suit this summer? 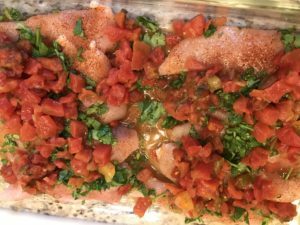 Here’s a no fat, no carb, no sugar and no dairy, PACKED with flavor Mexican chicken recipe with Spanish Riced Cauliflower that is YUMMY!! 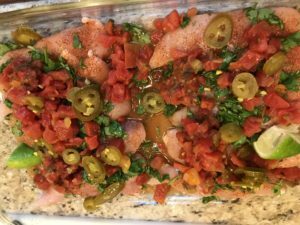 You’ll need: Chicken, Chipotle Seasoning, Cilantro, Rotel Tomatoes, Jalepeno slices, and Juice of 1 lime to make the chicken! It takes about 5 min of prep and 20-30 min of bake time depending on the thickness of your chicken. Just shake chipotle seasoning on both sides of your chicken in a large baking dish. 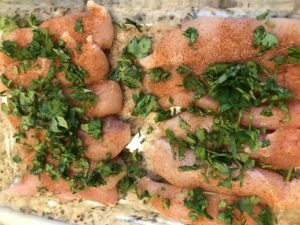 Sprinkle chicken with chopped cilantro and then dump on can of Rotel Tomatoes on top, sprinkle some jalapeño slices on top of that and then squeeze lime juice over entire dish of chicken. BAKE! Here’s what you’ll need in addition to your riced cauliflower you can find in your local grocery store! Just saute your riced cauliflower in chicken broth… Just enough to cover the bottom of the pan. 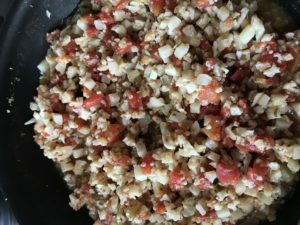 Add and mix in a can of Rotel Tomatoes, cumin, chili powder, Garlic salt and Oregano to taste…. cook until cauliflower is tender and most of the liquid has evaporated. All you’ll need is a side salad to compliment this meal! Enjoy the flavor and none of the guilt! 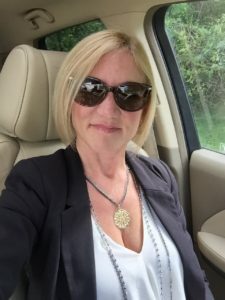 Admittedly, I’m almost 50 years old….. (How did that happen?) But I love where I am in life because I have figured out a lot! Of course, my elders would say, “You don’t know what you don’t know.”, and that is true. I say that about my kids. They are very responsible and make good decisions so far in life but they don’t know what they don’t know… and that can ONLY be learned through experience. Life is a series of experiences…… and experience is what you get when you don’t get what you want most of the time! I’ve learned a lot in my short life so far…. even had to deal with the death of two parents and that, my friends, will give you experience. I have thought a lot about my blog and where I want it to go…. My passions are family, faith, food and entertaining, creative ideas like decorating and fashion/accessorizing along with my passion for gadgets and products I love…. I also LOVE organization and love to travel. 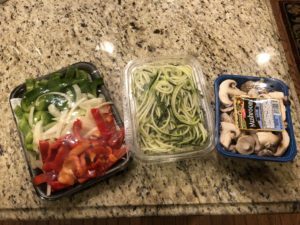 I love to cook healthy food and FINALLY figured out how to keep my “mid-life weight” under control by choosing healthy food….. REAL food and not products I have to purchase. THAT makes me excited! It gets me excited to share this wisdom with people who have not figured it out yet….. Being a woman today is an interesting journey…. Many of us work, either part time or full time and want to maintain a balance of work/life and family…. while trying to be organized enough to cook healthy meals, take care of ourselves and do all the things that make us happy while not losing our sanity as we try to take care of the ones around us that we love. I really feel like I have some great tips and great ideas to help women keep that balance, feel productive and feel sane doing it because of “experience”. We won’t all be perfect… but we will find some peace and sanity doing it. 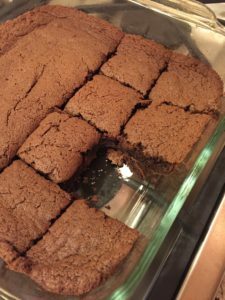 Best Gluten Free Brownie Ever! I’ve recently tried to eliminate Gluten from my diet. Not because I’m intolerant, but because I needed to lose weight! One of my friends asked for Gluten Free Recipes today and so I got inspired to post a great and VERY easy recipe here on my blog! I hope you enjoy it as much as I do! Would love your feedback! Preheat the oven to 325 degrees F. In a large bowl, whisk together the almond butter, syrup, egg, ghee, and vanilla. Stir in the cocoa powder and baking soda. 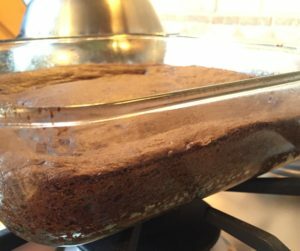 Pour the batter into a 9-inch baking pan. 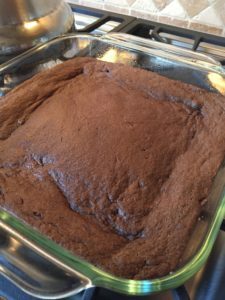 Bake for 20-23 minutes, until the brownie is done, but still soft in the middle. Does anyone else feel like they are just coming out of their summer “fog”? I am. It seems to take a while to get back in the groove after having no schedule in the summer. Don’t get me wrong… summer was productive. It wasn’t just sitting by the pool and sipping drinks….. we got a lot of projects done around the house but it has seriously taken me until MID- October to feel like things are settling into a groove! Crazy! So… The reason I said “Happy New Year” is because I think August or September (depending on when your school starts) should be the NEW YEAR! It’s a time when we start over…. refresh…. get into a routine again after a summer of being less structured. Kids go back to school, Mom’s start to get things in order around the house.. and maybe start to take care of themselves again. Work schedules out of the house seem more relaxed during the summer because everyone is on vacation here and there and Fall, well, everyone is back to business! Even the calendars you buy at the store either begin in January or academic calendars begin in EITHER July or August? How confusing! I seem to place less emphasis on the “new year” in January and seem to feel a lot more inclined to start over and start fresh in September? How about you? I begin to eat healthy again after a summer of indulgences…. I begin to exercise again because there is a routine and I begin to organize after a summer of having everyone in the house. September seems to be MY new year! So… I am taking it on… Got new glasses to start off the “new me” and I’m back to cooking healthy and eating better! I’m reflecting on the past with perspective… and dreaming of my future. Are you ready to see some posts because I took most of the summer off? What do you want to hear more of? Here are my passions: Decorating, entertaining, fashion & accessorizing, product junkie, food and cooking, parenting, travel, some DIY projects, and Organization and business! I feel like my years of experience can serve me well as I’m venturing into the “mature adult” phase of my life! Tell me what you want to hear more of! I’d love to share! This winter… I decided to cut out the crap and eat nothing but REAL food… Yep… basically protein, veggies and fruit. That is it. No Gluten… no Sugar… no dairy. I had to get creative with my eating….. so I wouldn’t get bored! SOOOO I bought a Spiralizer! How fun is this? This made eating veggies so much more interesting! 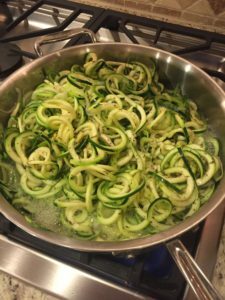 Here you see my spiralized Zucchini that I could saute in onions and garlic OR…. use as a zucchini noodle for my tomato sauce! Yum! I discovered how fun it was to spiral things… like onions (thinly sliced,) potatoes, cucumbers, and squash! Think about it… thinly sliced red onion for salads, burgers or sandwiches…. 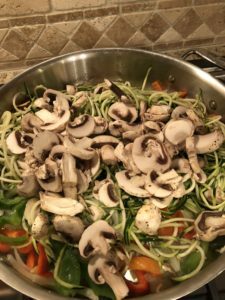 thinly sliced yellow onion for french onion soup, spiraled cucumber for an interesting cucumber salad with rice vinegar and toasted sesame seeds or apple cider vinegar, dill and pepper…. OR Zucchini “pasta” to satiate even the worst pasta craving! It worked! Potatoes also work great in the spiralizer…. for great home fries! Oh my goodness! So yummy! 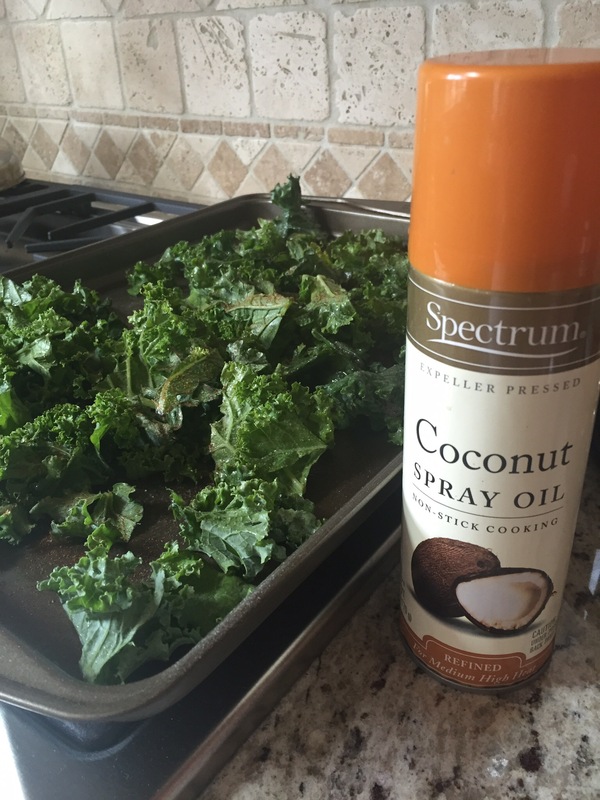 So if you are looking for a fun kitchen tool this summer that inspires healthy eating…. 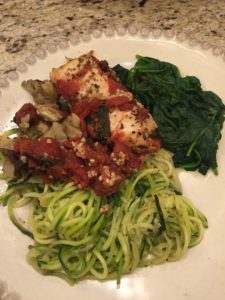 Enjoy getting your Spiralizer! I’m not even sure if that is a word… but… I’m sticking with it! Do you love a little treat in the evening? But the glass of wine or bowl of ice cream in the evening is doing a number on your weight? 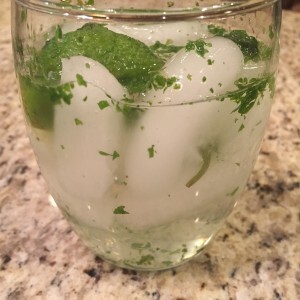 Try my calorie free Mojito! This is my new favorite concoction! Seltzer, Lime, Mint and a little liquid Stevia! Stevia takes the place of simple syrup.. and gives you that sweet taste! 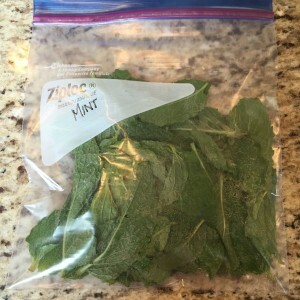 Since good Mint is hard to find… I buy a lot of it, wash, remove the leaves from the stems and freeze! 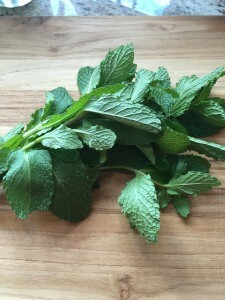 When I want a little mint in my drink, I simply remove from the freezer… crush a few leaves and enjoy! Now… if you want to turn this into a cocktail for the weekend… add a little Titos Vodka or Organic cucumber Vodka for a little something low carb! I’ve been enjoying my mocktails every evening…. 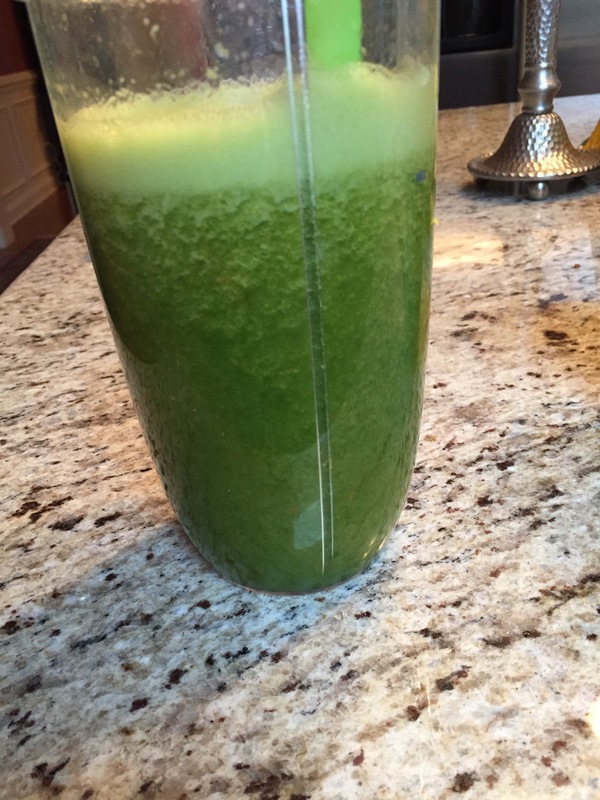 and if you don’t have mint… just do lime, seltzer and stevia…. Let me know what you think! Are you working on your Spring Slimdown for bathing suit season? Almost every woman I know…. and some men, are trying to exercise and eat healthier for Spring! For the last 30 days or so, I’ve eliminated sugar, carbs/gluten and even fat from my diet… except good fats like nuts, coconut oil, avocado etc. I have not had anything to drink but water, tea and coffee and have basically eaten WHOLE foods! Lean protein, vegetables and limited fruit. First 7 days were hard! I admit it! The natural inclination to grab a cheese stick, a piece of chocolate, a chip or two was super strong! Now… I’m almost reformed although I admit I crave an occasional bagel, cookie or pasta, I’m really doing well! Just thought I would share some of my favorite new healthy recipes with you over the next few weeks…. I would love to hear some of yours! 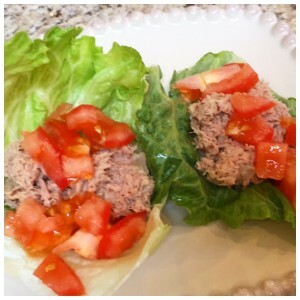 One of my favorite lunches is tuna with onions and dijon mustard wrapped in lettuce and topped with chopped tomatoes! Lunch is under 200 calories and is filling and delicious! Add salt and pepper to taste! Leave out that mayo! It’s packed with unnecessary calories! Getting slim doesn’t mean not eating….. it just means you can eat REAL food … delicious food! Here’s to our heath! Women typically wear a pendant necklace… usually something meaningful to them or just simply trendy or nothing at all. 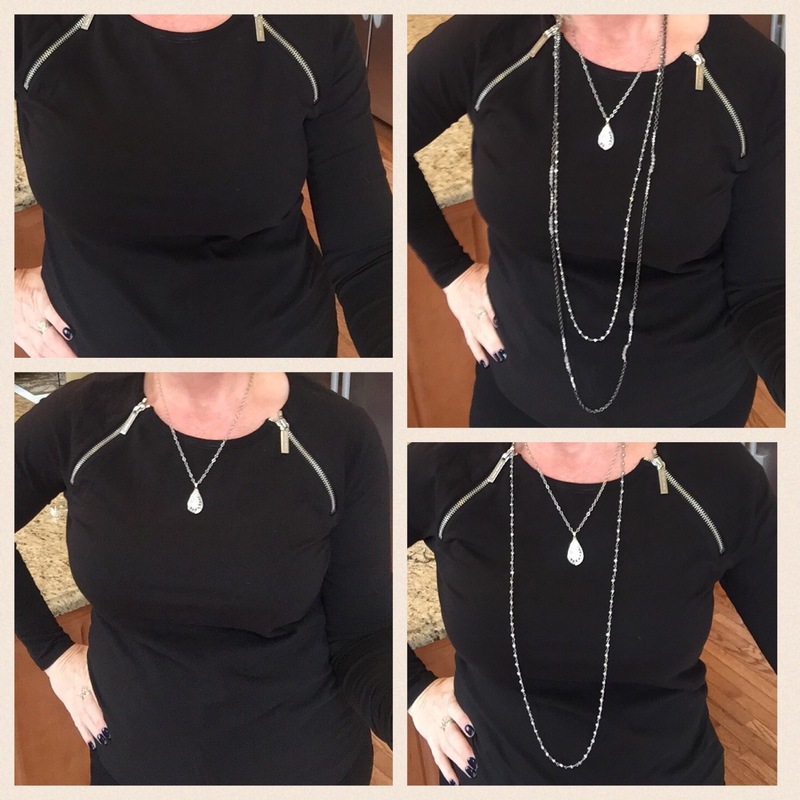 Notice how adding a few longer thin and lightweight necklaces can actually draw your eye vertically…. making you not only look thinner but even taller than you are! Your visual lines are vertical not horizontal. Layering jewelry is also very trendy right now… but it can be intimidating at best! You want to know how to do it right… and that is what I sincerely love about eSBe Designs Jewelry! I have learned a lot by representing our designer and well, it’s like Garanimals! Everything mixes and matches flawlessly… because we have ONE designer.. not a design team but one talented American designer that designs every single piece! So while you are exercising and eating healthy to shed a few pounds to get into that swimsuit….the right jewelry can transition you flawlessly into the next size down. I love helping my clients select just the right pieces to suit their jewelry style and wardrobe! I’d love to help you to either locally or electronically through messaging! Send me photos and I’ll provide custom jewelry wardrobe selections for you based on your preferences! Visit www.esbedesigns.com/theda to view the entire collection. We all want to eat healthy right? It’s soooooo hard! I know! I’ve been struggling with the same 2-3 pounds again and again. After my mom passed away, my comfort may have been excess calories ;-). I have tried lots of things over the past year! I have been exercising about 3-5 times a week for the whole year doing everything from exercise videos to walking or biking outside. I have gained muscle definition and strength but still have a cushy layer over it. ;-/. I tried some other systems from protein shakes and cleanses and nothing seemed to work for me. They “work” but you have to be super strict about them. No deviation. I needed a system that I could eat REAL food and that I could incorporate into a very social calendar. So out of desperation I tried a green smoothie “diet”. A friend of mine told me about it…. AND…. it worked. It was easy too! I felt super good about it because I bought my ingredients and blended them up in my Nutribullet. I have not gone to a nutritionist… YET… but for the first time in years, I’m losing weight and keeping it off. So 2 times a day, usually, I’m blending spinach or kale with frozen fruit like Bananas, Oranges, berries etc. sometimes adding a bit of mint.. or some Stevia for added sweetness. After you get over the green color, you’ll find the smoothies are delicious! Snacks are usually a hard boiled egg, kale chips, a Kind Bar, a few almonds or a green apple and a nice salad for dinner with a little egg, grilled chicken or turkey for added protein. I’ve pretty much eliminated meats from my diet… no dairy and no processed sugar but I’m not being totally nutty about it. On vacation, I tasted dessert… and had a glass of wine or two. If you are struggling with weight in your 40’s… maybe you would want to try this too and let me know how it’s going. I’m excited to finally have found something that works for me. I’m not at my goal weight yet.. but for the first time, I see results! 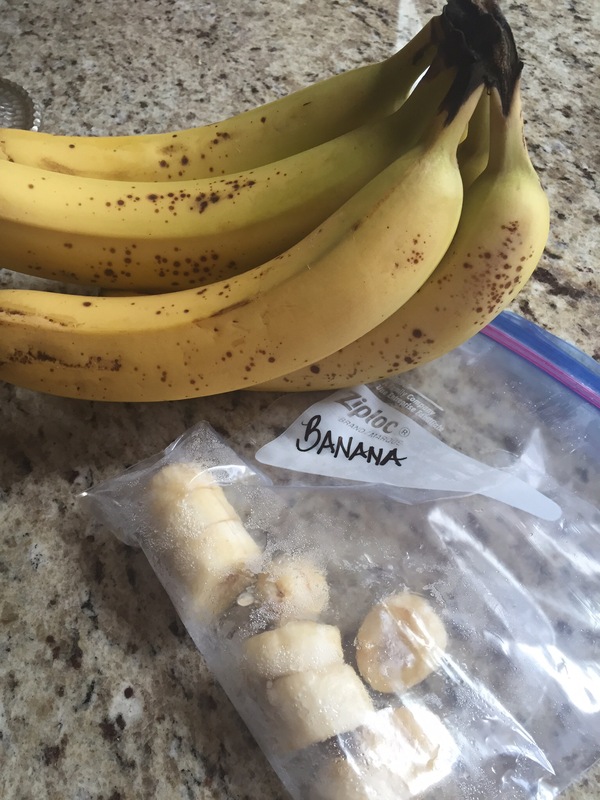 If your bananas or other fruit are about to go beyond ripe…. slice and freeze so you can use in your smoothies. Frozen fruit eliminates the need for ice cubes and keeps your smoothie nice and cold! The PERFECT Kale chips….. I found that if I spray them with coconut oil… they get the perfect amount of “oil” and then sprinkle with garlic sea salt or just salt and pepper… even tried cayenne pepper and that’s yummy too! Broil on Low or bake at maybe 450 degress… turn off the oven and let the oven just simply dry it out so it does not burn. 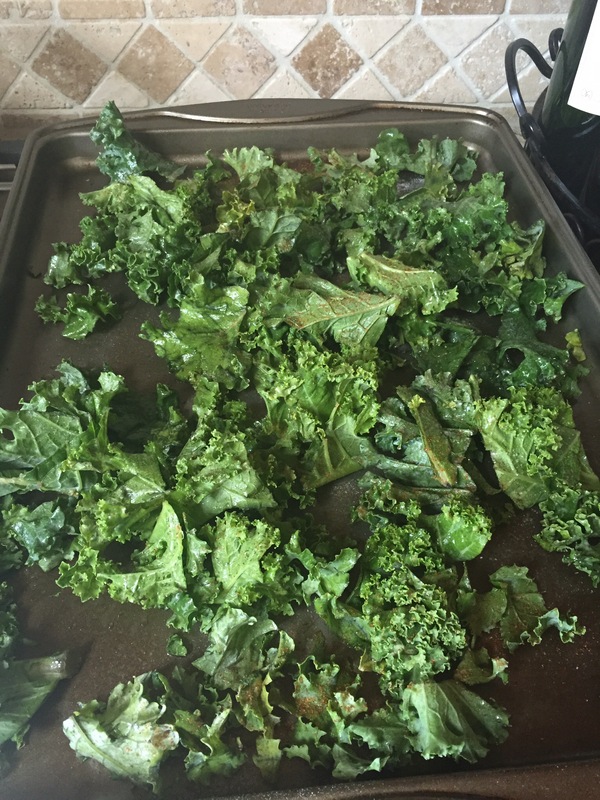 This is a great method when you are in a hurry, want to make kale chips but don’t have time to watch the oven…. put them in a hot oven, turn off the oven and leave. When you come back….. Voila…. kale chips! Enjoy! 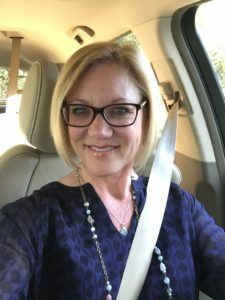 Martha Stewart – Here I come!